When you’ve been paying your premium and an accident occurs or tragedy strikes, you expect your insurance company to have your back. Unfortunately that’s not always the case. Nothing is more frustrating than unexpectedly having to use your insurance benefits only to find out that your insurance company refuses to meet its end of the bargain. Worse yet, if you’re involved in a claim where someone else’s insurance refuses to pay the damages owed to you, the situation can become even more frustrating and complicated. There are two types of complaints you can file against an insurance company that can help you resolve your claim. 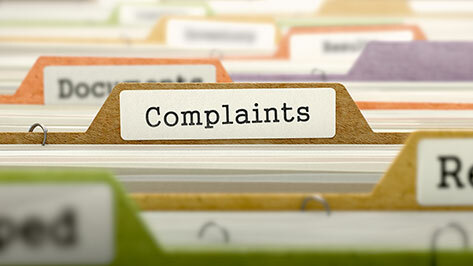 The most common way to file a complaint against an insurance company is to submit a complaint with the Texas Department of Insurance (TDI). This department was created to help protect consumers from dishonest and unethical insurance companies and practices. TDI can’t fix all complaints, but it does respond to many auto, homeowners, life, health, and title insurance complaints. TDI regulates all insurance written in Texas and is tasked with overseeing the insurance industry in general. To file a complaint against an insurance company in Texas with this department, visit their Website (this should be its) and fill out their form. Like many state departments, TDI is overworked and underpaid. Nevertheless they can be helpful resolving an issue you may have that may not warrant the filing of a lawsuit. Most of the complaints people file against insurance companies have to do with claim settlements. For these types of complaints, it may often be better and faster to resolve the issue by taking legal action outside of the scope of what TDI can do. For example, if you have been injured and there is either no or not enough insurance to cover your expenses related to the accident, it may be time to hire a lawyer to help you file a lawsuit. While the thought of filing a lawsuit against an insurance company can seem frightening to many people, it’s done quite often and quite successfully in Texas. The most frequent type of lawsuit against insurance companies that we see has to do with automobile accidents, of which there are thousands of in Texas every year. Common insurance disputes and issues that we see include not having enough insurance (Texas limits are 30/60), being involved in a car accident without insurance, or the driver of the car not being covered by the active insurance policy. In many of these frustrating situations, you may be required to look to your own insurance company and policy for compensation for everything from medical expenses to fixing or replacing your damaged vehicle. This often happens when drivers are under-insured, forcing you to pay the difference of the damages incurred. Recently, one of our clients was involved in a tragic accident when he was hit from the side by a person who ran a red light just outside of Houston. The careless driver had a minimum insurance policy that did not cover the full cost of the damages that our client suffered. His medical bills spiraled, enough that the insurer refused to pay based on their own unfaithful interpretation of the their driver’s policy. Our client’s family was devastated. We sued the insurance company and we won. We were able to get the insurance company to pay its policy limits so that the client was able to receive proper compensation. Another example of having to file a legal complaint against an insurer might be when your home is damaged and your insurance company refuses to pay. The insurance company may say that it’s outside of your policy limits or have a different interpretation of what you understood your policy to say. This can be devastating when your home needs repair. When filing a lawsuit against your own insurance company, there are various laws that apply to your situation, such as contract law, the Deceptive Trade Practices Act, and other insurance provisions that require fair treatment. Keep all your receipts related to your expenses. This includes repairs to your property (home or auto), medical bills, doctor’s appointments, medical equipment, etc. Anything you purchase related to your claim is important to make a copy of and put in a file. Always take pictures. Take pictures whenever possible of your damaged property, repairs, and anything related to your claim that you think may be important. Make sure you get everything in writing. When dealing with yours or somebody else’s insurance company, always make sure you get every claim or statement made over the phone or in person in writing. You are within your right to ask for any conversation, confirmation, or agreement to be produced in writing for your records. Sometimes, it may be necessary or inevitable to file a lawsuit if you cannot resolve your claim fairly through negotiation or through the Texas Department of Insurance.